OUR MOST POWERFUL BATTERY JUMP START EVER!! 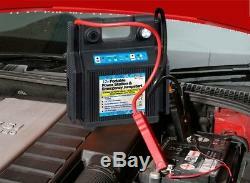 - WILL JUMP START ALL CARS, PERFORMANCE CARS & TRUCKS! Fully Rechargeable 12v or 24v battery with built-in booster cables to jump start most vehicles including trucks. Heavyweight Internal battery suitable for jump starting most trucks, cars, vans & more. Heavy Duty Impact Resistant Housing. OFF Switch cuts power to Booster Cables preventing accidental shocks, until the booster clips are fitted correctly. Then select correct voltage 12v or 24v for the battery being used to begin the jumpstart. 12v/24v Charging Adaptor and Home 230/240v AC Charging Adaptor Included. RoHS Compliant & CE Approved. 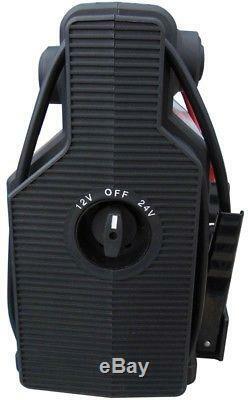 Internal 44Ah Battery (2 x 22Ah), 12v: 2500 Peak Amps, 24v: 1200 Peak Amps. LED Warning Lights for Reverse Polarity, Battery Charge Level & Full Charge. Please Note: All brands of Jump starters can only jump start a vehicle with weak battery and in case if battery is totally flat or dead, these power packs will not be able to jump start. The main purpose is to assist in jump start if battery does not have enough power to start the engine. This product is supplied with a minimal charge at manufacture, it is unable to function in any way unless the unit is fully charged over a 48 hour period, This is essential before any use. All Units Are Checked and Tested Before Dispatch. We are one of the UK's largest distributors of Car, Caravan, Leisure & Garden Accessories. Our brand is now recognised in over 20 countries worldwide, and this is set to expand further. You will need to pay for the cost of returning the item(s) and the item(s) remain your responsibility until we receive them. 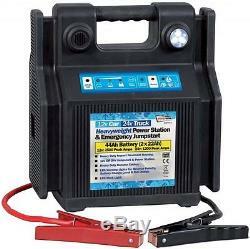 The item "Battery Jump Start Heavy Duty 12v Car & 24v Truck Portable Power Pack Station" is in sale since Thursday, July 6, 2017. This item is in the category "Vehicle Parts & Accessories\Garage Equipment & Tools\Battery Testers & Chargers\Other Battery Equipment".